I just did a review of this awhile ago, but I thought I’d go into a bit from an actual usage perspective. As I reported in my review, I took it to my weekly solo acoustic gig, and it worked fantastically. I also took it to my Sunday church gig and used it on another guitar: My Fender Stratacoustic, which is a really tough guitar to tune. I also use it regularly in my home studio and it works flawlessly. Okay, I know. It’s just a tuner. However, what I find so special about it is that it’s the first clip-on tuner I’ve used that is really accurate. Plus, it has Peterson’s sweeteners built in, and to me, the sweeteners make all the difference in the world. Sweetners are minute adjustments to the tuning so that chord intervals sound, well, sweeter. Guitars are generally built to even temperament; that is, they’re set up so that each string is tuned to an exact frequency. The idea behind the Peterson tuning sweetners is that even temperament is fine until you play chords. We’ve all been there. Tune up the guitar with a standard tuner like a TU-2. The tuning sounds fine. Then you play a chord, and you have to make adjustments so the chord sounds good. The sweetners take this in to account, and instead of tuning to the exact pitch frequency, tune a little off to account for presses on the strings. 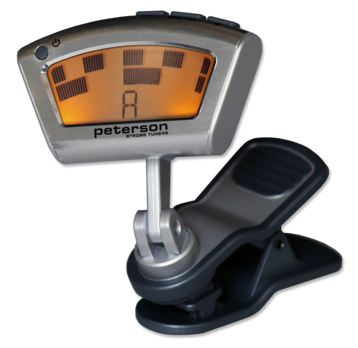 The result is that when you tune with a Peterson tuner, you rarely make post tuning adjustments. Very cool. Originally, I thought I’d simply use the StroboClip in my home studio, but I’ve found it to be an invaluable tool for gigs. For instance, as the lead guitarist in my church band, I often do solos with a lot of bending which, after awhile, will make the tuning drift a bit. With my StroboClip, it’s simply a matter of turning down my volume, then doing a quick tune. Oh that reminds me! I totally dig the LCD screen for tuning. Even for how small the unit is, the movement of the checkerboard pattern makes tuning a lot easier than trying to nail it with a bank of LED’s. Hey. I just bought this today. which mode should i use when adjusting intonation? Standart or sweetened? Sweetened for sure! You’ll notice a HUGE difference when you play a chord right after you tune. Just set to GTR.